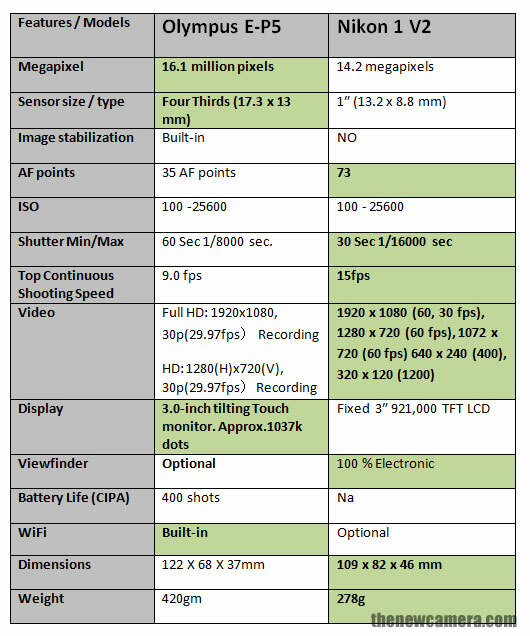 Olympus E-P5 vs Nikon 1 V1, The newly announced Olympus E-P5 features bigger M 4/3 format sensor and more megapixels compared to Nikon 1 V2 on the other hand Nikon 1 V2 offers advance AF System and better Video Mode. Sensor: 14.2MP 13.2 x 8.8mm CMOS sensor , Olympus E-P5 features 16.1MP Four Thirds (17.3 x 13 mm) Live MOS sensor, so with bigger sensor size you get better low light performance and wide dynamic range. AF System: Nikon V2’s features Advanced Hybrid Autofocus System that combines two technology – Phase + Contrast Detect AF system, With Phase detect AF system Nikon V2 have 73 AF points and Contrast detect System have 135 AF points. Nikon V2 offers much faster focusing and shooting at up to 60 frames per second (with AF locked). Without AF locked, maximum continuous shooting speed is 15fps. Olympus E-P5 have Contrast based AF system but due to the advance Frequency Acceleration Sensor Technology (F.A.S.T.) for Faster AutoFous Speed, the F.A.S.T technology works in AF in Single, Continuous and Tracking modes. In High Speed mode, up to 9 fps can be shot at full resolution with a maximum of 15 frames in RAW and 19 frames in JPEG. .
Video: Nikon V2 offers Full HD Video @ 60fps, Olympus E-P5 limited to 30fps at Full HD Video Recording. Display: Olympus E-P5 have high-resolution 1037K tilting display unit with touch control,Nikon 1 V2 have fixed display unit with 921K TFT LCD. WiFi: E-P5 features built-in Wi-Fi connectivity, Nikon V2 optional WU-1b Wireless Adapter is available. Verdict: For still shooters we highly Recommend to Buy Olympus E-P5, But for sports shooters and videographers we recommend Nikon 1 V2. thats good so wich one is best?